Check here for general announcements about the Centralia (WA) High School Class of 1963. June 12, 2018: This site is under construction! There’s a “forum” page that you can access through the link to Meeting Place at the top of this page. There’s also a link to a blog page, but there’s nothing useful there yet. Maybe we’ll figure out how to allow guest blog posts so you can let your classmates know what you’ve been up to. The “Directions” link takes you to a page with directions to the Sunday picnic that’s part of the 55th Reunion Weekend. About the meeting place: we don’t have a SSL certificate yet, so our website isn’t available through the more secure “https”. Your browser may complain about this. It’s your option to heed or ignore that warning. You should register with a user name and password you don’t use anywhere else, for sure, and be aware that it’s possible that someone could get the email address you use to register and then bombard you with spam (or worse?). 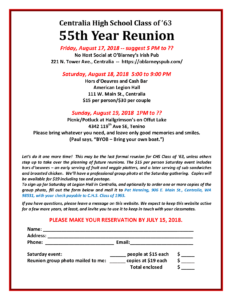 We’ve been planning the 55th year reunion the past several months. An announcement and registration form is being mailed out to all class members for whom we have addresses, but if you see this first, you’re welcome to use the form here. This form is the same as the one being mailed, except that it doesn’t have contact emails and phone numbers that you could use if you have questions. 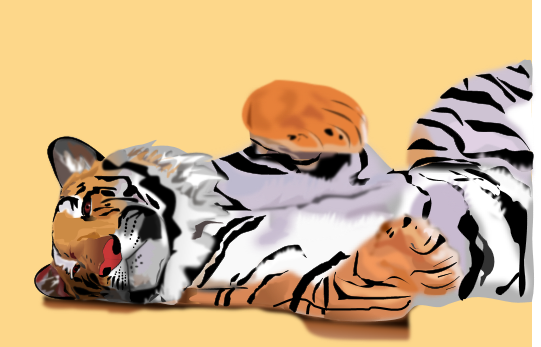 If you send an email to contact at chstigers63 dot org, we’ll try to answer your questions.